We all know a strong core supports the spine and helps us to avoid injuries. Here are two core exercises I find very beneficial. These exercises works not only your core but also your shoulders. 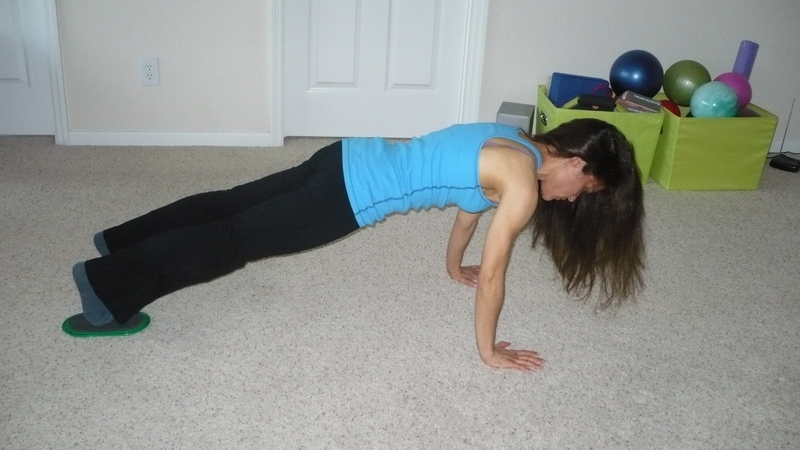 Start in a plank postion, wrists under shoulders and abs pulled in. Raise your right arm to the ceiling, while rotating your body to the right. turn your head so you are looking at your hand. Hold for a counf of 3. Start in a plank position, with your feet on a Valslide. Engage your abs and lift your hips to the ceiling, while sliding your feet towards your hands. Hold for a count of 3 and return to the start. * If you do not have valslides, you can use 2 paper plates. Try these and let me know what you think.